In the beginning, the architects who dreamed of tall buildings in the late nineteenth century faced the same problems as their Medieval predecessors: height and weight. The familiar formula, the higher the building the heavier its walls and the greater the weight the walls had to bear and the thicker they became and so on, meaning that like the cathedrals before them tall buildings were inherently limited. The problem was an engineering one, but it was also a materials issue as well. The cathedrals and the structures up the time of the Eiffel Tower traditionally used stone cladding of some kind. The Eiffel Tower soared because it had no cladding. Its naked skeleton straddled the Place du Trocadéro, undressed and unadorned. According to legend, it was the architect William Lebaron Jenney (1832-1907), inspired by the sight of his wife placing a heavy book on the top of a birdcage, who solved the formula and eliminated the weight problem of using the new Bessemer steel for his interior armature for the Leiter Building in 1879 and for the “Father of the Skyscrapers,” the Home Insurance Building of 1885. As any art historian knows from her study of Medieval cathedrals, it was flying buttresses or external supports which allowed for larger openings, windows filled with stained glass. 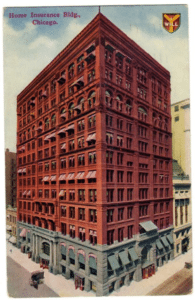 A thousand or so years ago later, Jenney’s ten-story building opened up with rows of double windows for each story. As if paying homage to the cathedral, the last row of windows was arched. This detail was overshadowed by two tall stories that capped the building in 1891 with large but rather pedestrian windows. The birdcage insight coupled with the invention of a safe elevator by Elisha Otis (1811-1861) in 1853 resulted in architecture become a sport in which engineers and builders raced each other to the top. 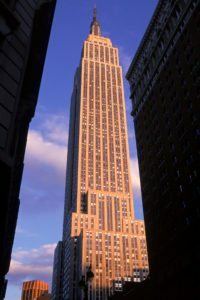 But dreams, big and tall, require the same kind of money; and the Empire State Building of 1931 was the joint effort of important and well-heeled investors that included John J. Raskob of General Motors and Pierre S. duPont of E. I. duPont de Nemours and Company, supported by the public relations expertise of Al Smith, former politician. According to Skyscrapers: A Social History of the Very Tall Building in America by George H. Douglas, Raskob asked the architect William Lamb (1893-1952), “Bill, how high can you make it so it won’t fall down?” For the General Motors chair of Finance, the news that Walter Chrysler had decided to build the tallest building in the nation came as unwelcome news, for that had been his idea as well. Therefore, as Douglas tell the story, Raskob decided to set the height at 1250 feet, including a mast that would prove useless until it was transformed into a radio tower. Not only would the Chrysler Building be shamed but the Eiffel Tower and its Otis elevators would be dwarfed by the new structure titled “The Empire State Building.” That name, sounding grandiose but promising success when construction began in October in 1929 became a burden and a joke when the “Empty State Building” could not rent its vast spaces in the midst of the Depression in 1931. 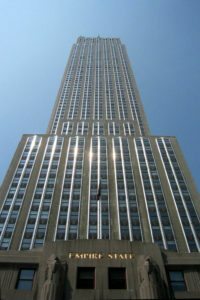 The exterior of the Empire State Building seems to be the mundane New York City skyscraper, with a stacking of ziggurat forms that complied with the set back laws seen in the preceding tall building. 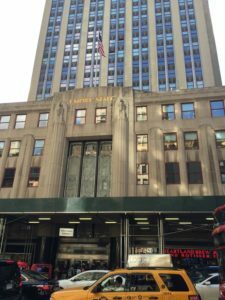 But this building was one of the early expressions of Art Deco in its Americanized version and one must go beyond the graduated insets towards the top to appreciate the surface designs. The question is how? After the fifth floor setback, beyond the window washers or King Kong, who can appreciate the finer details of the vertical trimmings between the smallish horizontal windows that were lined up in a rising ribbon of glass? The architect took advantage of the prevailing style, Art Deco, which was based upon straight lines and geometric shapes, rather like Art Nouveau reformed by the sobriety of Cubism, to emphasize the height of the structure. 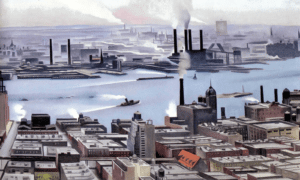 And it is the unprecedented piercing of the New York sky that was the significant fact of the Empire State Building that seemed to rise forever, attenuating its stretch in a thin mast meant to catch a passing zeppelin. The statistics of the structure were impressive and well known: it was the first building to have over one hundred floors or stories contained in 1,250 feet made of 60,000 tons of steel. According to PBS, this cage of steel, strong, sturdy, and light-weight was clad in 10 million bricks covered by 200,000 cubic feet of Indiana limestone and granite. But this great amount of weight was surprisingly light compared to other buildings thanks to the unprecedented use of what John Tauranac termed “metal facing.” It was these ornamental trimmings that not only lessened the heft of the façade but also emphasized the zig-zag elevation. Douglas was making an interesting point. After the Second World War, the city and indeed the rest of America would be dominated by the arrival of the Bauhaus style reintroduced as tall oblong glazed upright boxes: the International Style. This building by William Lamb, as modest and self-effacing as its exterior Art Deco trimmings, slid in between the end of one war and the beginning of another. The next war would wipe away those last lingering traces of decor or ornamentation in favor of the fastidious edges of Mies van der Rohr. 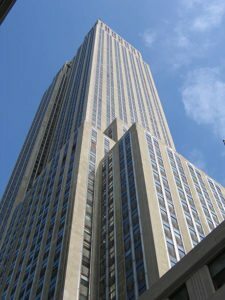 The modest Art Deco exterior of the Empire State Building did not date it when it was confronted with the Twin Towers of Lower Manhattan.The Empire State Building was nearly empty for years and was not filled to capacity for ten years in 1941. Over time, and certainly thanks to the Second World War, the investors were paid back and the profits began to flow, suggesting that although in real estate the key is location, location, location, timing is everything. 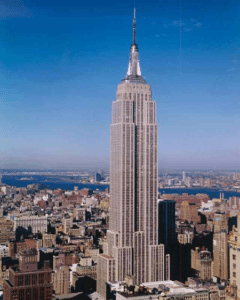 The Empire State Building was nearly empty for years and was not filled to capacity for ten years in 1941. 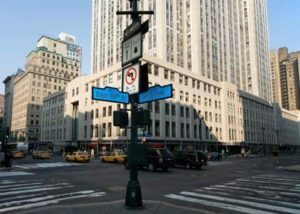 Over time, and certainly thanks to the Second World War, the investors were paid back and the profits began to flow, suggesting that although in real estate the key is location, location, location, timing is everything. Empty it may have been, but the Empire State Building was anything but subtle in its interior design. To enter the building was to step into an Art Deco dreamscape, to be discussed in the next post.